Aviators use air navigation to determine where they're going and how to get there. 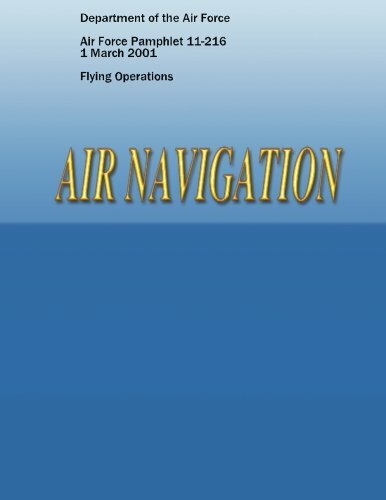 This Air Force Pamphlet 11-216, “Air Navigation,” serves as a reference for techniques and methods used in air navigation. It provides information on all phases of air navigation. It is a source of reference for navigators and navigator students. This text explains how to measure, chart the earth, and use flight instruments to solve basic navigation problems. It also contains data pertaining to flight publications, mission planning, in-flight procedures, and lowlevel navigation. This pamphlet may apply to the Air Force Reserve Command (AFRC) when published in the AFRC Index 2 and to the Air National Guard when published in the NGR (AF) 0-2. A glossary of references and supporting information used in this publication is at Attachment 1; mathematical formulas to use as an aid in preflight and in-flight computations are at Attachment 2; chart and navigation symbols are at Attachment 3; and a subject index is at Attachment 4.